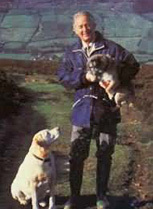 On this day in 1995 James Alfred Wight, better-known as James Herriot, died at the age of seventy-eight. Wight went to the Yorkshire Dales in 1940, fresh out of Glasgow Veterinary College. Over 2300 packed his memorial service in York Minster Cathedral; over 100,000 a year now visit the museum at the site of the original practice; over sixty million copies of his books have been sold.